When we drive up to the Hyatt Regency Tamaya Resort and Spa, the life size, bronze figures in the entry plaza seem to receive us, especially “Welcoming Woman,” a Native American whose hand extends in greeting. A grandfather telling stories to children, a farmer with a hoe and a grandmother scooping water complete the sculptural piece. Placed in front of the modern resort, the artwork sets the tone of tradition complimented by twenty-first century amenities. 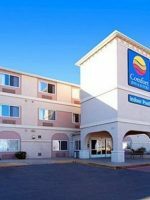 That’s fitting since the 350 room resort spreads out on nearly 500 acres of the Santa Ana Pueblo’s 73,000-acre reservation, home to the Tamayame people. 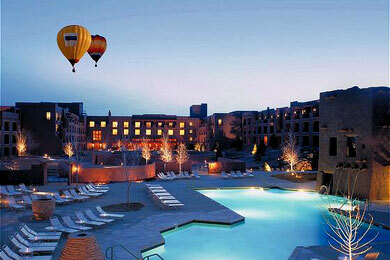 The 700 inhabitants of the pueblo own the resort, which opened in 2001, but Hyatt manages the property. 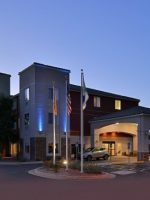 Come here to relax or to use the resort as a base from which to explore nearby Albuquerque and Santa Fe. In the late afternoon, savor the views of the Sandias from the Rio Grande Patio outside the lobby. At dusk the mountains glow a brilliant reddish pink, revealing why the Spaniards named them “sandia” or “watermelon.” In fall, the cottonwoods turn the color of spun gold, creating a spectacular scene. The resort’s architecture and decor reflect the property’s Native American heritage. The adobe style buildings suggest the traditional dwellings of the Santa Ana Pueblo’s old village, an 800-year-old settlement nine miles from the resort, but off-limits to the public except on special days. “Tamaya” is the native name for this village. Pottery pieces rest atop the Hyatt Tamaya’s chimneys, symbolizing how the elders used to catch rainwater. 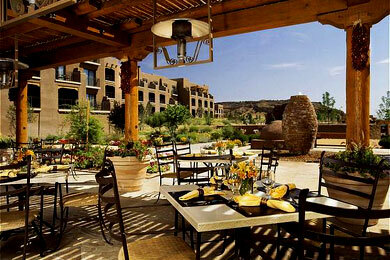 Courtyards, as in Native American communities, are used by the resort as gathering places. At select times, Native dancers and musicians dressed in full regalia perform for free. The resort’s decor is Southwestern with a Native American flair. Leather couches, backgammon and chess tables mix with woven baskets, tribal jugs and Native American portraits in the living-room like lobby, anchored at each end by gas fireplaces. It’s relaxing to sit in the lobby, enjoying the views while listening to a Native American flute player. Check the schedule for complimentary performances. At all Hyatt hotels, up to two children under 18 stay for free when sharing with two adults. 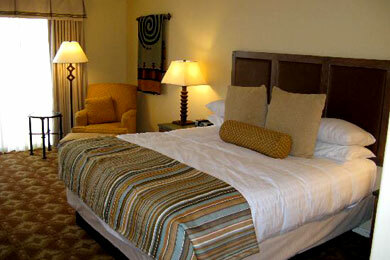 The resort provides complimentary cribs and cots. Most rooms come with balconies or patios. All accommodations come with free Wi-Fi, coffee makers and refrigerators. The decor creates a sense of place. The walls are the yellowish- beige of maize and blankets from the Santa Ana Pueblo hang on the walls. The standard rooms are 377-square feet. There is one king or queen bed or two double beds. Suites feature one king or two two double beds and a separate sitting area with a pull-out sofa. We spent a week here. 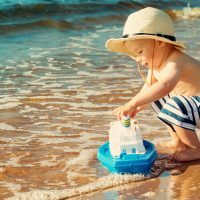 The swimming pool and whirlpool were not adequately monitored for chemicals. Pool had too much chlorine, so our grand daughter’s eyes started hurting, and whirlpool temperature was too hot and it had too much chlorine. I could only sit in it for 2 minutes. My whole body developed allergic reaction, that lasted 5 days. So we didn’t use these facilities much. Hyatt charges a resort fee $30 per day per room. So our family paid $90 per day in resort fee! I informed the front desk about the whirlpool temperature and her response was that she will inform the engineering division. No apologies! One night, the alarm went off twice around 5:00am. So we all got up and couldn’t sleep after that. My daughter went to front desk three Times to find out what was happening. They said that they are trying to find out! Even though the customer service liked to contact customers using sms, they didn’t care to send any info about the Alarm system to customers. No apologies! Third stay here, it is the greatest place to stay. The staff the whole team exceeds my expectations always. The food is great in any restaurant at the facility. They are all about making your stay a good memory on vacation. The property is beautiful. The mother owl and baby owl on the walking path was great. Do. Or pass this place up. We stayed here traveling to and from Moab to Dallas our home. In June 2009 all the Camp Hyatts partnered with National Geographic Kids magazine to add programs that teach children about animals, culture, recycling and water. The New Mexico property's Camp Tamaya is no exception. In fact, teaching children about Native American culture and the desert environment were elements of Camp Tamaya's program from its inception. 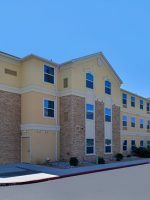 The Camp Tamaya facility, located near the kid-friendly plaza pool, consists of two rooms outfitted with craft tables, a child-sized basketball hoop, billiard table and box games. 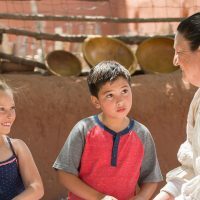 At Camp Tamaya, ages three to 12 do such Native American activities as create sand paintings, play Native American games, learn to weave and find out about indigenous plants and animals and the life giving Rio Grande River on a guided stroll of the Bosque. Morning sessions run from 9 a.m. until noon, afternoon sessions from 1 until 5 p.m., evening sessions run from 5 until 9 p.m. The all-day program runs from 9 a.m. until 4 p.m. The resort limits the number of children so it's best to reserve a space when you book your reservation. Also, before you arrive at the resort, have your kids check-out the Camp Hyatt National Geographic Kids site with its child-friendly games that teach kids about the region's animals and ecology. 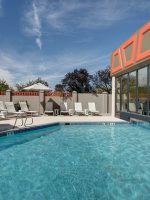 There's plenty of swimming with three outdoor pools. The plaza pool entices kids with its water slide, the Oxbow pool has a waterfall and the kiva pool is heated. Alas, there are no indoor pools. For more fun, try horseback riding. The stable accommodates never-evers to more advanced riders. Children age 8 and older can go on guided trail rides while those ages four to eight can get a taste of being in the saddle by sitting atop a pony and being led around a ring. For more horseback adventures, sign-up at the stable for trail rides that follow the river or take you to view ancient petroglyphs. 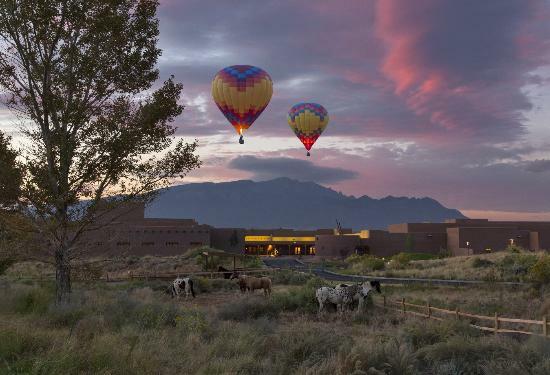 The Srai-Wi activities at the Hyatt Tamaya make a stay at the resort special, enabling families to learn about Native American traditions together in an enjoyable way. 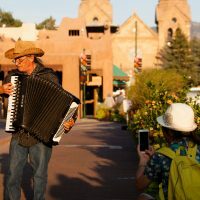 During the complimentary Stories Under the Stars, Emmett "Shkeme" Garcia, a Santa Ana tribe member animatedly shares the Pueblo's tale of the creation of the stars and constellations. Sit around a fire and learn how a naughty coyote created the configurations, then toast S'mores. On the Journey Through Tamaya, another complimentary program, families can tour the Tamaya Cultural Museum and Learning Center. The one-room facility with its baskets, pottery, clay-making display and Tamaya history reminds visitors that the tribe inhabited this land long before the Spanish and other settlers arrived. Afterwards families can go on a guided walk through the Bosque, a forest of 1,000 cottonwoods. To restore the native cottonwoods, the tribe removed the many salt cedar and olive trees that were choking the native plants. The expert guides will point out hawks circling above the Sandia Mountain peaks, and identify the buffalo and wheat grass. Other nice touches: Fitness stations in the Bosque path entice those out for a run. Teens like to try the sit-up benches, pull-up bars, climbing pole and other equipment. There are also emergency call boxes in case help is needed. In the Clay and Culture class, a member of the Santa Ana Pueblo helps families make pottery. The two-hour sessions use prepared clay and employ a pinch pot and coil method. As you roll and shape the pottery, the expert tells how she learned pottery from her grandmother, detailing the traditional method for gathering the clay and drying the pottery for days on a fire of charcoal and cow dung. Additional Srai-Wi experiences include bread making in a traditional oven, silversmithing, archery and a pueblo drum making. Call ahead to see what Srai-Wi programs are available as some are offered seasonally only. Borrow bicycles to pedal to the stables. Kids' bikes and trailers are available for little ones. In high season, don't miss the rodeo, typically held on Thursdays. You can walk to the stables or climb aboard a hay wagon. 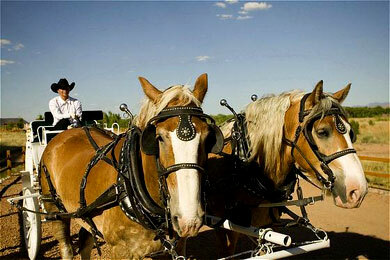 The rodeo, a show of roping and riding by the wranglers, is complimentary. Kids, ages three to eight, can join in by "riding" stick horses in a barrel race. The resort charges a fee for the grilled burgers, hot dogs and other fare. At buffets and brunches, children 12 and under receive a 50 percent discount. Dining rooms have high chairs and booster seats and bottle warmers are available by request for rooms and the dining room. Kids can order hamburgers, chicken nuggets and a roasted turkey sandwiches from children's menus at any of the restaurants. We like resorts that provide a place to buy relatively inexpensive snacks to go for hurried mornings and for hungry afternoons. The Trading Post Gift Shop near the lobby sells chocolate chip cookies, muffins, coffee, hot chocolate and cider. Along with breakfast, the Santa Ana Cafe serves lunch and dinner. Menus include southwestern items. The food is mostly tasty, but not outstanding. Lunch features fajitas, fish tacos and roasted chicken tortilla soup along with burgers. We appreciate that the dinner menu includes less expensive items such as burgers and cobb salad as well as pricier entrees such as short ribs of beef. Leave room for the resort's signature dessert: red chile peanut butter pie. The fine dining outlet the Corn Maiden is open for dinner only on Friday and Saturday. This fine dining restaurant takes its name from the honored symbol of the Santa Ana Pueblo. The restaurant caters to adults, specializing in grilled meats. Room service items include chicken noodle soup, turkey hot dogs and grilled cheese. 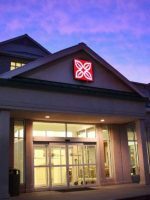 We really like the complimentary flute playing in the lobby and the evening S'mores and storytelling (on selected nights). Take advantage of the Srai-Wi activities. The complimentary ones such as Stories Under the Stars and Journey Through Tamaya are must dos. Somewhat pet-friendly, the resort allows pets 30 pounds and under to stay for an extra fee. Evening babysitting is available by reservation. Stand-out souvenirs at the Trading Post Gift Shop include the Native American children's storybooks by Santa Ana tribe member Emmett Garcia and the keep-the-kids- interested "Big New Mexico Activity Book." If you're looking for something locally inspired to read, the store also sells Tony Hillerman novels, many of which are set in New Mexico and Arizona and feature sensitively drawn Native Americans. The Galleria Tamaya sells authentic and unusual Native American jewelry as well as rugs and pottery. High season is Memorial Day through October's Balloon Fiesta in Albuquerque. Low season runs from after October's Balloon Fiesta to Memorial Day. The resort doesn't typically offer a shoulder season. 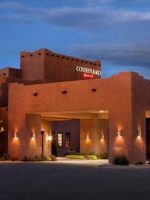 The Hyatt Regency Tamaya Resort and Spa is located about a 30-minute drive north of Albuquerque International Sunport, Albuquerque's airport, and about a 40-minute drive south of Santa Fe. The Tamaya Mist Spa incorporates Native American traditions and local ingredients. For example, in some treatments red chile is added to the local mud to stimulate blood circulation. The exfoliant employed in the Three Sisters Salt Scrub combines blue corn meal, Anasazi beans and pumpkin seeds. In Ancient Drumming after a therapist applies a mud masque, he "drums" away stress by applying flaxseed-filled muslin bags dipped in pinon scented oil. At the spa, be sure to try the homemade granola that contains a small amount of green chile for that southwestern bite. Adults who like to spa as well as horseback ride, can opt for the resort's Saddle Up and Spa package, a combination of trail rides, hands-on time with the horses and pampering spa treatments. Play 18 holes of golf at the Twin Warriors Golf Club, designed by Gary Panks.